Neusner had no formal education in Judaism and only a rudimentary knowledge of the Hebrew alphabet. All of this would work to his advantage. Because he was not from the “old world” and because he lacked a traditional yeshiva or seminary education, he was neither limited by tradition nor aware of his own shortcomings. Neusner, instead, represented a new paradigm: a suburban Jew, a second generation American, with no formal Jewish education outside of Reform Sunday school, and someone who could barely read a line of Hebrew. Only such an individual, as paradoxical as it may sound, could propose a new model for examining the sacred texts of Judaism by integrating them into the academic study of religion. When the young Neusner eventually went off to Harvard in 1950 as a young undergraduate, there was, quite simply, no exemplars or prototypes of what it meant to be an American, let alone secular, scholar of Judaism or someone who wanted to work with Jewish data within a discipline that was just beginning to come into its own on American soil, the academic study of religion. Early in the fall of his freshman year, Neusner became increasingly aware of the discrepancy between Judaism and the secular academy. His undergraduate advisor, Harry Austryn Wolfson, the important scholar of premodern Jewish philosophy, tried to discourage the young Neusner from pursuing a life in the academic study of Judaism on account of his largely nonexistent Jewish education. Wolfson’s assumption was that even a secular scholar of Jewish texts ought to have traditional yeshiva training. After graduating from Harvard and a fellowship year at Oxford, Neusner enrolled in rabbinical school associated with the Conservative Movement at the Jewish Theological Seminary (JTS) in New York. Neusner claimed that of anyone in his incoming class no one was in a worse situation than him, saying that it took him three years to master what the majority of his fellow students already knew. Although he would go on to receive rabbinic ordination from JTS in 1960, it quickly became clear to him that he could not be a pulpit rabbi. So he enrolled in the doctoral program in religion at Columbia University, from which he also graduated in 1960. After a year (1961–1962) at University of Wisconsin-Milwaukee, in a position for which he quickly realized that he was ill-suited, he took up a two-year postdoc at Brandeis. In 1964, Fred Berthold, the chair of the Department of Religion at Dartmouth College, encouraged him to apply for a job at the College. At Dartmouth at that time were Hans Penner (d. 2012), Jonathan Z. Smith, and Wayne Meeks. Neusner recalled how once at a departmental colloquium during his first year on the faculty, he presented a paper on his current research. Penner accused him of being a historian as opposed to a scholar of religion and that his true academic home ought to be a history department and not a religion one. Neusner took offense and, from that point on, we begin to see a shift in his work. If his work tended to be largely descriptive prior to Penner’s challenge, it becomes more analytic and bold after it. Neusner calls this the “turning point” in his career. It is at this point in his career that we can really begin to define Neusner as a scholar of religion, despite the fact that he received his PhD from a religion department. In 1990 Neusner moved to the University of South Florida to take up a position as Distinguished Research Professor of Religious Studies, and, in 1994, he also began to teach at Bard College in Annandale-on-Hudson, New York, as Distinguished Service Professor of the History and Theology of Judaism. Neusner’s honors include: the Medal of Collège de France and Medal of Regione di Campania (1990); the Martin Buber Professor of Jewish Studies at the University of Frankfurt (1991); life member of Clare College, Cambridge (1992); Guest Research Professor at the Åbo Akademi University in Turku, Finland (1993); Visiting Fellow at the University of Canterbury in Christchurch, New Zealand (summer, 1994); Humboldt Research Professor at the University of Göttingen in Germany (1995); Visiting Professor of Theology at Uppsala University in Sweden and The Queen Christina of Sweden Medal from Åbo Akademi University in Finland (1996); and the Medal of Pope Benedict XVI (2010). In addition, he received over six honorary doctorates. Neusner was among the first Presidents of the post-NABI AAR in 1969. It was under his presidency that the permanent “chairs” of each section were created with the aim of structuring the program by soliciting and accepting papers in areas such as Judaism, Asian Religions, Philosophy of Religion, and so on. Prior to this, the Annual Meeting consisted solely of invited plenary speakers who would deliver lectures. Neusner’s goal as president was to make the national meetings into research meetings, using the model supplied by the American Oriental Society (AOS). Another feature that he introduced in his presidency was to propose a general topic and then invite scholars who were interested in the question, but working with different religious traditions, to present papers. One such topic he encouraged was comparative messianisms. In addition to his work as President of the AAR, Neusner did more than anyone to make the study of Judaism into a permanent part of the academic study of religion. He died on Saturday, October 8. Zekher tzadik livrakha. May the memory of the righteous be a blessing. Aaron W. Hughes is the Philip S. Bernstein Chair of Jewish Studies at the University of Rochester. 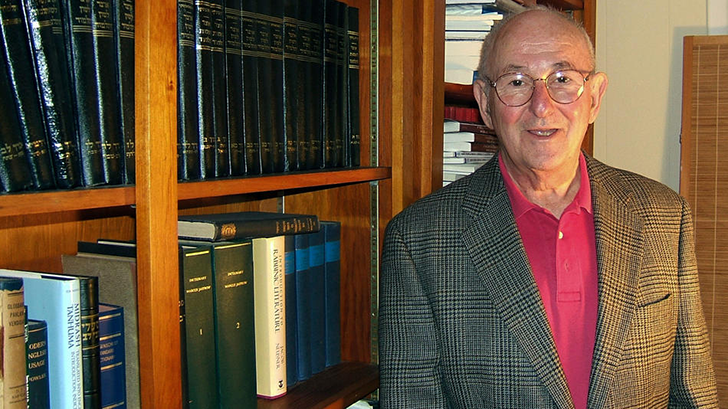 His most recent publication is Jacob Neusner: An American Jewish Iconoclast (NYU Press, 2016).